Visual Acuity: your ability to identify progressively smaller lines on an eye chart. 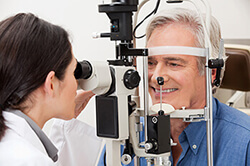 This test is performed with corrective lenses when indicated. Intraocular Pressure: The eye, like any fluid-filled compartment, has an internal pressure which can be measured. Pupils: the colored part of your eye moves dynamically like the aperture blades of a camera lens. The way your pupils open and close in response to light and visual targets gives insights into the health of your eye and visual pathway. Extraocular Motility: Grading the fitness of the muscles responsible for moving your eyes and keeping them aligned. Visual Fields to Confrontation: a fundamental way to check your peripheral vision. External Exam: Assessing the health of the skin, bones, and structures surrounding the eye. Slit Lamp Examination: A microscope is used to carefully inspect both the outer surface of the eye and the inside of the front of the eye. Gonioscopy: a mirrored lens to look within the anterior chamber angle of the eye where fluid filters out of the eye. This test is essential for patient’s being screened for glaucoma. Fundoscopy: special lenses are used in tandem with the slit lamp microscope to inspect inner contents of the eye including the retina (camera film) and optic nerve. Refraction: Determing your eye’s “prescription” by carefully selecting lenses that maximize your ability to see clearly. Visual Field Testing: An automated, precise version of the visual field to confrontation test. The patient looks at a fixed target and is asked to trigger a button when flickering lights are seen. The computer records these responses and creates a visual diagram map of their central and peripheral field of vision. Ultrasound (B-scan): An ultrasound probe is used to visualize parts of the eye below the surface. 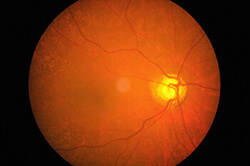 This test is particularly useful when cloudiness or scarring makes routine eye examination techniques difficult. 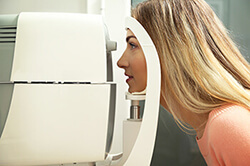 Ocular Coherence Tomography: This highly specialized smart camera is similar to an ultrasound machine that uses light waves instead of sound waves. It can give invaluable insights into the health of the retina and optic nerve. Topography: Used to measure the curvature of the outer window of the eye, this machine is useful for both diagnosing and administering treatment for various eye diseases. Biometry: This device measures the length of the eye. This data is paired with information from corneal topography to help choose an intraocular lens for patients undergoing cataract surgery. Pachymetry: A hand-held ultrasound device measures the thickness of the outer window of the eye. This thickness- which is approximately one half of a millimeter- is important to know and consider when interpreting the intraocular pressure.